* Circle time is a time set aside for the teacher and the class to interact as a group. Many times themes are presented, calendar is discussed, and songs and chants are performed. 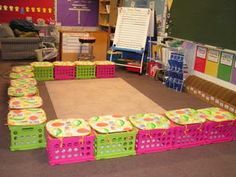 Here is a great way to set up a circle time in your classroom.